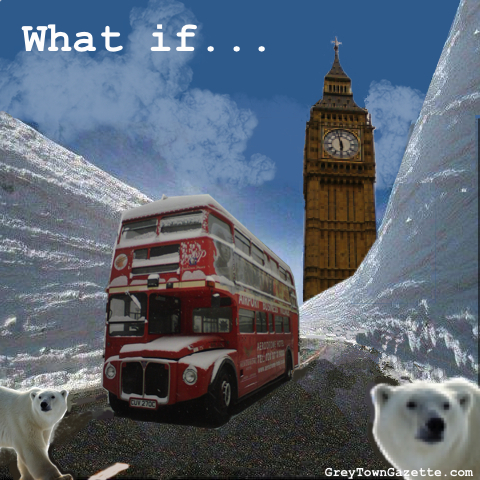 Enviro-mental Special Feature: Are we in for an Ice Age? ..that could be bad news! Trudging down the A22 in a bitter head wind with snow still on the ground and pondering how in my childhood mid-March was associated with the verge of spring, I suddenly recalled hazy memories of geography classes when we learned how the world was overdue for an Ice Age. This article isn’t challenging the theology of climate change (freedom to follow the religion of our choosing should be a principal of all free societies), but it is questioning whether the current argument between proponents and deniers is missing the point. Man-made global warming, if it is significant, might be distracting us from a potentially much more serious issue: the warming effect, if any, could be masking the early start of a natural trend towards global cooling. A new Ice Age! That would be truly bad news. Theory says it should be getting warmer, but some recent reports indicate that since the late 1990s that hasn’t been happening. This is alarming. Why? The consensus theory of Global Warming seems logical: increasing levels of CO2 and other ‘greenhouse’ gasses should lead to increasing global air temperatures. Also, many of the world’s weather monitoring stations that were once in open countryside are now in expanded urban areas so we should expect them to read higher temperatures. Yet if, despite these effects, the temperature readings are staying constant it could imply an underlying counter-force is at play. The global climate might be about to turn chilly. If push came to shove the world could afford to lose the Maldives and a few Suffolk coastal villages, so Global Warming is something we could adapt to, but losing half of the northern and southern hemispheres to ice sheets would be an altogether more serious problem, especially for residents of important places like Grey Town. It might come as a shock to many people brought up with the certainties of the modern world, but natural phenomena such as glaciers have no regard for human rights or planning regulations. Apart from a grudging respect for the sun, they show no regard for anything at all. A two mile thick thousand mile wide zillion ton ice sheet is going to cause a great deal of bother for towns, cities, and even celebrities who get in its way. Mountains too. Long before that though, a cooling climate would be seriously inconvenient for the farming sector. Farming is still important: it’s ultimately where our supermarkets and fast-food purveyors source their produce. Even turkey twizzlers. But it’s very hard to grow things in permafrost. On the bright side, the total collapse of agriculture will probably solve the nation’s obesity crisis. And the shrinking of the oceans caused by the growth of the ice sheets will mean it will be possible to walk to France so holidays will be cheaper. But apart from these undeniable benefits, the future would be pants basically. Ice ages really do last for ages. Even for a society used living on a diet of Big Brother, Red-Nose Day and X-Factor, living in a dank cave for ten or fifty millennia will seem very tedious. Well we could put off the inevitable by burning as much fossil fuel as possible to give our planet a comforting atmospheric duvet. That might buy us enough time to develop sufficiently powerful fusion reactors so that we can keep the ice at bay with a national defense grid of giant electric heaters, which even if it doesn’t work, like alternative energy projects it will at least provide plenty of much-needed employment to the masses and income to the political and industrial elites. So do your bit! Keep the home fires burning!